The Northern Rhône is most famed as the home of Syrah. That's not to say it doesn't make some fine white wines, but it is the Syrah-based reds that have been the source of its relatively recent recognition as one of the world's truly great wine regions. 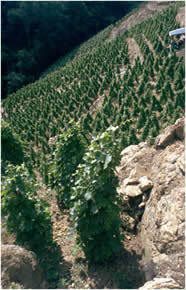 Of the several subregions within the Northern Rhône, the hillside appellation of Côte Rôtie in the far north of the region produces what many consider to be the ultimate expression of Syrah. It's an appellation that has fascinated me for some time, and this is why I chose it as the focus for the first wineanorak tasting, held in central London last week (April 17, 2002). Nine wine nuts gathered to try a selection of 12 Côte Rôties, carefully chosen to reflect the range of styles this region produces, and spanning several recent vintages. These wines are usually quite hard to get hold of. Consider the fact that the whole appellation covers just 205 ha (one Bordeaux property reviewed recently on wineanorak, Talbot, has 104 ha of vines alone), and you'll see that only tiny quantities of Côte Rôtie are produced. But despite the scarcity and intrinsic quality of these wines, prices are still relatively sane. With the exception of Guigal's single vineyard wines (La Mouline, La Turque, La Londonne; La La's for short) -- which, with their reliance on new oak, could be argued to be fairly atypical of the region -- you can pick many of the best wines for less than GB£30 (US$45). Two other points worth mentioning. 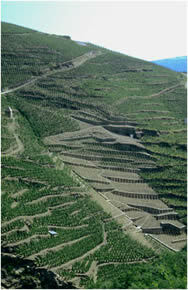 First, these vineyards have been cultivated for more than two millenia, making them among France's oldest. Second, there's commonly a dash of Viognier added (legally, this can be as much as 20% of the final blend). How much this has to do with the perfumed nose typical of Côte Rôtie is not clear. I enjoyed this line-up of wines very much: not only were the wines uniformly of a high quality, but also it was fascinating to see how much variation in character there was within such a small appellation. Favourite for me was the Gilles Barge Cuvée du Plessy 1999, although it may eventually be outperformed by the wonderful 1999 from Jamet, which is potentially longer-lived. Low level cork taint here, which only emerges after the bottle has been open a while. The beautifully dense palate gives a hint as to how good this wine would have been without the fatal taint. Not rated.